Tardigrades are tough, tubby, and tiny. There are more than 1000 species, and all of them are itty-bitty—about the size of a grain of sand. 1. ALL OF THEIR NAMES ARE CUTE. “Old” doesn’t really begin to cover it. Scientists estimate that tardigrades have been around for 600 million years. To put that in perspective: Dinosaurs first appeared about 230 million years ago, which makes T. rex and friends the new kids on the block. 3. THEY CAN LIVE PRETTY MUCH ANYWHERE. And we do mean anywhere. True to their nicknames, most tardigrades prefer living in the water or on damp places on land in the world’s temperate zones. Dirt, leaf litter, and patches of moss are favorite hangouts. But those are just the tardigrade’s preferred habitat; these tiny animals could easily live in the fires of Mount Doom if they had to. They may be little, but they’re darn near unkillable. Moss piglet under a microscope. Image Credit: Bob Goldstein, UNC Chapel Hill. 4. THEY’VE GOT A SUPERPOWER. What makes tardigrades so tough? One word: cryptobiosis. Translated literally, cryptobiosis means “hidden life,” and that’s exactly what it is: a form of suspended animation in which organisms can go on living even as they look dead. Cryptobiosis is the secret to Sea Monkeys; it’s also the reason tardigrades can survive pretty much anything. So when times get tough, tardigrades play dead. They hunch up into little dried husks and more or less shut down, which drops their metabolisms to 0.01 percent of their usual rate. In this deathlike state, the tardigrade becomes nearly untouchable. 5. THEY DON’T FUSS WITH THE THERMOSTAT. Tardigrades can withstand temperatures that would easily fry or freeze a human being. Scientists have exposed them to heat over 300°F and cold below 1° Kelvin, or -458°F—a temperature at which most substances go bananas. Liquids turn to solids and gases turn to liquids, but the hardy tardigrade just keeps on truckin’. 6. THEY CAN LIVE IN SPACE. LIKE, OUTSIDE. Without the aid of a pressurized suit, humans can survive just a few minutes in the vacuum of space. Tardigrades can make it for 10 days. But the hazards of space go beyond mere skull-crushing pressure; there’s also UV radiation. Humans can withstand about 500 roentgens, or units, of ionizing radiation, but it takes more than 100 times that much to kill a tardigrade. 7. YOU CAN GET YOUR OWN. If, after reading all these facts, you find yourself helplessly charmed by the tardigrade, don’t fear: You can buy one. A stuffed one, anyway. 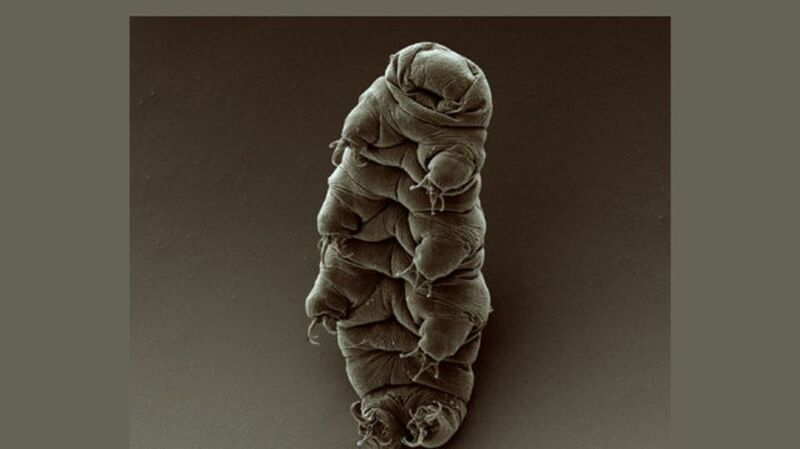 But that’s probably for the best; a real pet tardigrade might make you feel inadequate.